Sue Davis and her retriever, Flash, at the Westminster Kennel Club Show at Madison Square Garden in New York. When it comes to canine competition, Sue Davis mingles with the top dogs. 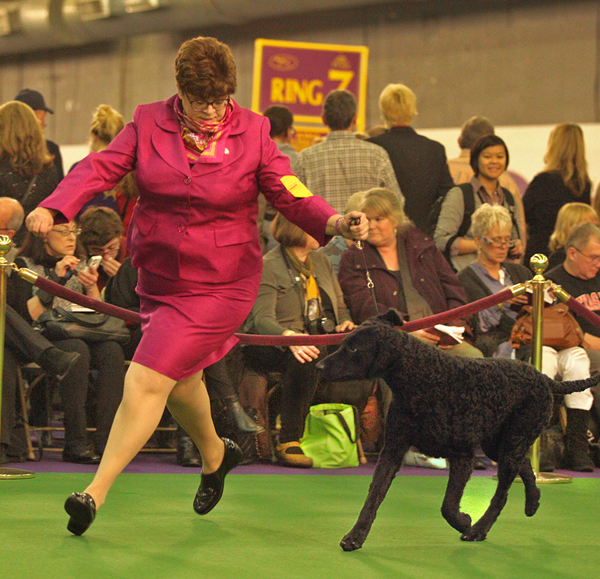 She and her curly coated retriever, Flash, were invited this year to compete in the iconic Westminster Kennel Club Show at Madison Square Garden in New York, considered the Super Bowl of the dog world. Davis, director of Undergraduate Admissions, made the exclusive list of invitees because Flash was ranked No. 5 in the nation for his breed, based on the number of points he earned in 2015 competitions. Just two years old, Flash took home a Judge’s Award of Merit from the Westminster show. “It was a thrill for us to represent our breed, and for me it was a just lot of fun,” Davis said, describing her friendships with dog owners from around the country and the world. Davis says she knew nothing at all about canine competition until 2007. That year she bought a dog through a newspaper ad and signed him up for obedience classes at the PetSmart store in Niles. The class instructor was so impressed with the dog, a chocolate Labrador named Pretzel, that she suggested Davis try showing him at an obedience rally. Pretzel did well in the show ring, winning fourth place his first time out, and Davis jokes that she was “bitten by the bug.” Now, nine years later, she’s raising six dogs at her kennel in Vienna Township, co-owns several more, and spends a good share of her weekends on the road participating in dog shows all over the United States and Canada. People often wonder if her dog hobby is making Davis rich – quite the opposite, she says. Top show prizes typically average around $100, at most, not enough to offset the cost of travel, lodging and equipment. Dog breeding is costly too, and she considers herself lucky if she breaks even after all the genetic testing, x-rays and other documentation required to breed a dog. Davis joined the YSU Undergraduate Admissions staff in 1991, with previous experience in admissions at Thiel College. She has a BS in Education from Bowling Green State University and a MA in Student Personnel from Slippery Rock University.